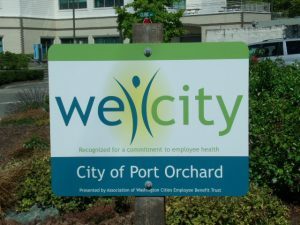 Full-Time - The City of Port Orchard offers a comprehensive benefit package for regular full-time employees. Part-Time - Regular part-time employees may be eligible for medical . The City currently pays 50% of the medical insurance premium for the employee only if the employee elects to pay 50% of the premium by payroll deduction. The employee may elect to purchase medical insurance coverage for their spouse/registered domestic partner and/or dependents at their own expense by payroll deduction. All Employees: The City offers either Regence/Blue Shield HealthFirst or Group Health ($10 Co-pay Plan) through the Association of Washington Cities Employee Benefits Trust (AWC). Non-Represented Employees: The City offers Washington Dental Service (Plan-A). The City pays 100% of the premiums for employees and dependents/qualified domestic partners. Teamster and Police Guild Represented Employees: The City offers Washington Teamster's Welfare Trust Dental Plan-A. The City pays 100% of the premiums for employees, and for dependents/qualified domestic partners. Non-Represented Employees: The City offers Vision Service Plan (VSP $25 Co-pay Plan) through the AWC. The City pays 100% of the premiums for both employees and dependents/qualified domestic partners. Teamster and Police Guild Represented Employees: The City offers Washington Teamster's Welfare Trust Vision Plan EXT. The City pays 100% of the premiums for both employees and dependents/qualified domestic partners. Police and Police Sergeants: The City has established a medical health retirement/voluntary employees' beneficiary association account ("HRAIVEBA") and deposits, on an annualized basis, three-hundred fifty dollars ($350) in each employee's account to be used for qualified medical expenses. Each employee shall contribute an annual matching amount of three-hundred fifty dollars ($350) to be deducted from employee paychecks on a pre-tax basis in equal monthly or bi-monthly installments. Regular full-time and part-time employees may be eligible to earn vacation leave as outlined in the applicable collective bargaining contract, employment agreement or City resolution(s). Currently, regular City employees receive 8 hours of sick leave per month (96 hours per year). The City observes 10 official holidays and 2 personal holidays. An official holiday that falls on a Saturday will be observed on the preceding Friday. An official holiday that falls on a Sunday will be observed on the Monday immediately following. Employees may take their personal holidays at any time with supervisory approval. Employees shall be allowed up to twenty-four (24) hours bereavement leave for death in the immediate family upon approval and authorization of the Department Director. For travel out of State, an employee shall receive, subject to the approval of the Department Director an additional sixteen (16) hours. Part-time employees will receive 50% of the above hours. The City offers an Employee Assistance Program (EAP) through the AWC. The EAP provides short-term, confidential counseling for City employees and their families. If needed, the EAP can also provide referrals to mental health professionals for more extensive, ongoing treatment. Employees have the option to purchase supplemental insurance plans such as life insurance, short-term disability and supplemental dental insurance through the AFLAC. Many of the plans feature pre-taxable benefits. Contact- Suzie Obrien -360-620-1514. Employees are covered by Industrial Insurance through the Washington State Department of Labor and Industries. Regular employees of the City are mandatory members of the Washington Public Employees' Retirement System (PERS) except Police Officers who are members of the Law Enforcement Officers' and Firefighters' Retirement System (LEOFF). Employees and the City contribute jointly to the plans. City employees have the option of participating in employee funded 457 Deferred Compensation plan through Washington State Deferred Compensation. This offers pre-taxable benefits and a variety of investment opportunities.